The Beaufort Pirate Invasion of 2010 is on the schedule for Twenty Ten and kicks off on Friday the Thirteenth of August. 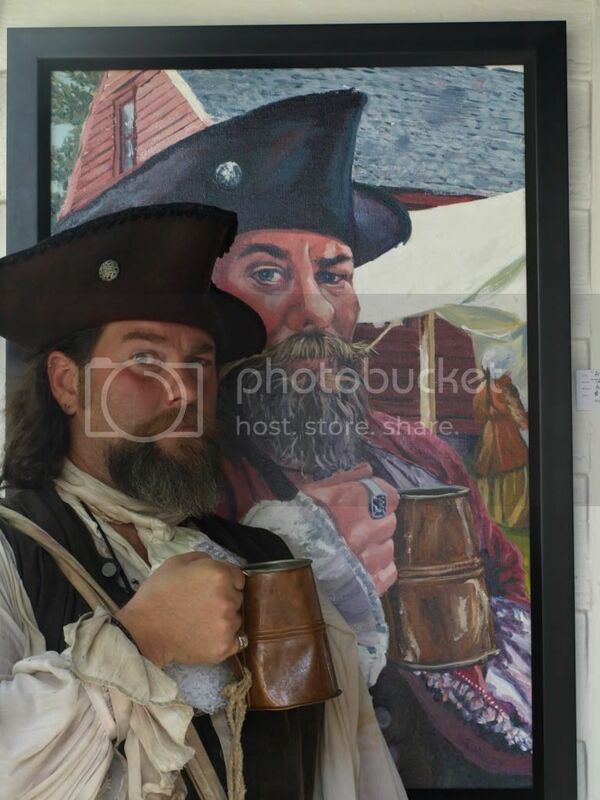 There will be a Pirate Encampment on the Historical Grounds, the Old Towne Center and again, reenact the Raid and taking of the Towne by Spanish Pirates in 1747. The Battle Reenactment is the Town's People and Malitia retaking the Town from the Pirates, a fair trial and hanging. There's Music, Grub and Grog. A Sea/Land Battle on Front St. Beaufort. Murder and Mayhem! Bring the wife and kids! More to follow! Back by popular demand! The "Rusty Cutlass" will be back to Beaufort this year. As you who know this band o' scallywags, they don't stop! There will be music. We hopes Willoughby Caught will be joining in with voice, whistles, strings and Bodhron. I knows I wont be refusin the chance to sing along wi' the likes o' sech! For more information, go to our website, above. Might ther bees a web site ? Using the link from last year - I assume it will be updated. Interests:Rogue Pirate...been on my own for quite a few months now. Not looking to sign articles (yet), but more than willing to come aboard for an event. Seems I wrote my reply on last year's post. I hope to get down to this event this year. Any crews willing to take on a marooner? As far as I have heard, this event is still on. I emailed my crews contact for this event to see if there are any further details available. Stynky was correct with the website address. Avast all! 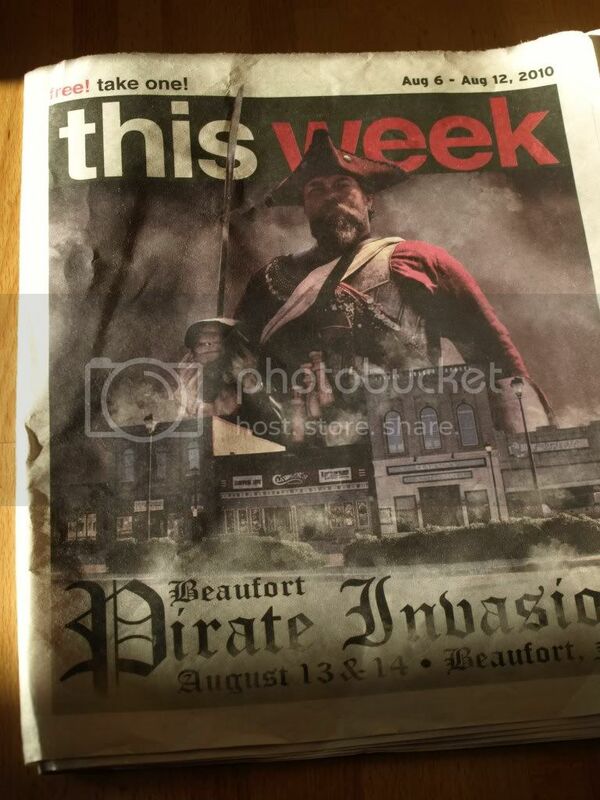 T'is with no doubt that the Beaufort Pirate Invasion is on schedule. The website is www.beaufortpirateinvasion.com and is active and up to date. Rusty Cutlass will be back this year and for those who haven't heard them, you'll stand a treat sez I. So, we be seein' ye at the Ol Towne o' Beaufort Aug. 13th! How does one secure camping rights onsite? Avast! There be but two days afore we be meetin' upon the Beaufort Towne Center. We'ns be takin' over the Towne and makin our camp there in the middle! There shall be food, grog and the music of Rusty Cutlass! Aye, T'will be a grand time indeed. checking in... dutch, grace, pern, h.m., ben safe home. T'is well t' hear o' me shipmates makin their homeports wi'out travail. To say it were a joy to have sailed wi' ye all t'would be a dis-service t' the feeling. Making the aquaintance o' so many I jus' be knowin in the Pub was all the more a pleasure. Stout hearts, brave shipmates, all! just pulled into port...litterally moments ago....i am physically exhausted...ehich means i must have had a great time. would really like to thank ALL my crewe as well as my fellow Breathern who so vastly welcomed with open arms my fellow travel mates..Barnicle Brad and Loose Cannon Laura...bein their first time out and all you proved to them(and well reminded me)...that their are no better folk...than Pirate Folk!! tho i did have to correct Loose Cannon Laura, that it was "HUZAH"...and not "WAZ-UP"...that everyone wa cheerin....tehehehehe,giggle ,snort!! and may they always be!!! Home from Beaufort and wishing this event could be much longer. I would like to thank our hosts for their gracious hospitality and allowing us to join in the festivities. To my “Angels” , thank you , as always, for all your time, talents hard work and support this weekend which resulted in a very successful display in camp, on the boats and battlefield and, with this year’s new addition, the Gaol. Well done! To our Pressed Men Guests, Dorian, Laura, Jana and Brad it was a great pleasure having you with us. I am glad you could all come out to play! 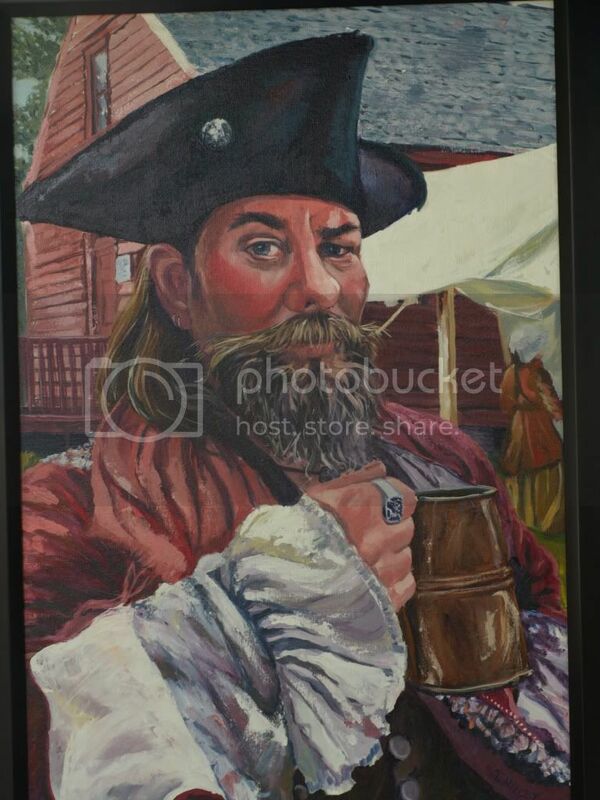 And finally to all the Brethren that attended, ye villainous group of scurvy scum, it was great to see you all once again and an honor to call you family…with a heavy heart , I am missing you all already… till the next time our paths cross once more….. Fair Winds! 1. Josh and Sarah, finally coming out of their bashfulness and taking their place in interaction with the event guests. They had such a good time, they even took most of the tent down by themselves. We always knew they could do it, now they know as well. 2. Having “Little Snot” in attendance and playing her first part in the gaol. She is always a pleasure, but I still insist there is no resemblance betwixt us. 3. The wonderful wrap party with the Carolina Black Flaggers…great apple pie and peach cobbler!! And Brad’s rendition of Dogzilla! 4. Having the delightful music of Willoughby Caught and Rusty Cutlass . Thank ye Willoughby for the new song! 5. The Devilmen shouting across the water “Look they have a zebra in their boat!” and Grace volunteering to lick my toes, of course she was safe on the Meka when she did..
7. Being arrested and escorted to gaol with a lovely lady on my arm, a drink in my hand and my sword still on my hip! 8. Listening to the lower classes in the gaol’s common cell below my more private accommodations all night long (what a bunch of whiners.) My “loyal” Mr. Lasseter’s patience and support whilst waiting for my sister to tear apart my coats looking for my letters of marque, whislt being locked away with Matty the Money Clipper, Cross the practitioner of black arts and Joshua who will do anything for a piece of bread. My heart goes out to ye lot, what with only Bess’s foul drinking water to appease your appetites. Remind me next time the lovely Silkie brings my meal to send ye down the left overs…ahem. 9. Matty and Finn’s calisthenics, up down, up down, every time an officer walked past. 10. Everyone else sighting Cousin Robbie BUT me! 12. "Parson, why is yer hand on my arse?" And of course, being with Family…. Had a fabulous time with everyone! Made it home safe and sound. Good to see familiar faces and to meet other newbies! Thank you, Captain Sterling, for having us...it is always a pleasure to be pressed into the Archangel crew . and Who is this man?...and why is he so damn pretty?? too bad some mangy "mutt" got into the way!! all seriousness aside...i absolutley see no resembalance what-so-ever....and caint figure out why folks were pointing it out?? there will be no living with him after this......none at all.......thansk for the great time everyone, twas truly one of my top events this year....great to see olde friends and new.......cheers to a great event! First two legs of the trip home are complete ...one more in the AM. Had a very HOT blast with everyone this weekend. So nice to have so many people turn out at one event. Great show! Thanks to those of you who have been doing this longer than I for your assistance. Thank those of you who are younger for your assistance also! lol Thanks to the organizes of the event and organizers of the crew. It was great to get so many of us so involved this go around. Great to see Gigi, Doubleshot & Dorian and to meet Kiera, Janna, Brad and Laura. I know we have our differences but I really love this family! some pictures of the event above, just scroll to down a bit to check them out.